alaTest has collected and analyzed 275 reviews of Samsung UE48JS8500 Series. The average rating for this product is 4.4/5, compared to an average rating of 4.3/5 for other products in the same category for all reviews. People really like the connectivity and color. The design and usability are also mentioned favorably. Comments about the glare and size are different. The energy efficiency and durability get negative opinions. We analyzed user and expert ratings, product age and more factors. Compared to other products in the same category the Samsung UE48JS8500 Series is awarded an overall alaScore™ of 91/100 = Excellent quality. alaTest has collected and analyzed 11 user reviews of Samsung UE48JS8500 Series from Amazon.co.uk. The average user rating for this product is 4.5/5, compared to an average user rating of 4.3/5 for other products in the same category on Amazon.co.uk. Opinions about the size and glare are overall positive. The sound and image quality also get good comments, whereas the reliability and durability get less positive views. Nano-crystals or quantum dot? Call it what you will; the march of LED-backlit LCD TVs continues on this 48-incher with blistering colour to spare, though this decent value SUHD TV is not quite the finished article. 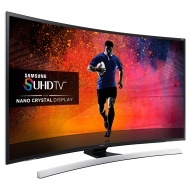 A preview of the new 48-inch mid-range curved Ultra HD 4K LED LCD TV from Samsung for 2015. Picture calibration is difficult but necessary. Probably would not purchase a curved screen in the future because of the viewing angle. picture quality is exellent.Watching films and sport is superb. Love the design look and features. Remote control set up. The Smart remote is an excellent device, but I'm having to use 3 different remotes to use all the options. On my old TV my sky remote worked everything.